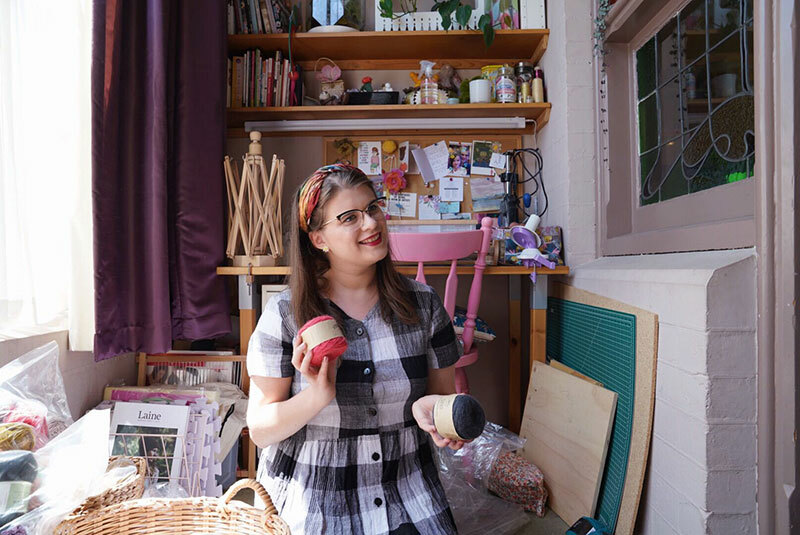 If you are at all on the internet you’re probably aware, if not a part of, the Marie Kondo inspired wave of re-organizing and decluttering that is sweeping the globe. I am certainly no exception, for the past few weeks I have been sorting through clothes, books, jewelry and old essays that I held on to “just in case”. The past six months have been a huge period of change for me. I graduated university, left my retail job of over two years and started working full time in a role I could have never imagined. I feel as if I have entered into an entirely new era, and I have been overcome with the desire to make my physical surroundings reflect that. I want to know how this new me dresses, what books does she own? What nicknacks does she keep on her shelf? Falling deeper into the making community has, of course, had an impact on all of this. Polyester has been replaced with linen and wool. Mass produced with hand made. The shelf where I kept half read fashion magazines now holds books about cooking, plants and - of course - making. It was only a matter of time until my attention came to my stash. Like the rest of my material possessions, my stash also reflects the eras of my making life. There is the cheap wool I bought as a teenager when I first learned to crochet and loved to make blankets and toys. There are chunky, lofty alpaca and smooth cotton yarns I bought at the now closed local yarn store. These skeins felt like such a huge investment at the time, but I wore my mustard alpaca cowl almost every day last winter. There is the yarn gathered after I started working at a yarn store myself. I have bags of favorite yarns that were discontinued and cleared, bought out of panic as if I would never find another yarn to love again. There are varied textures, colors and fiber blends collected as I was exposed to more patterns, aesthetics and making styles. Sometimes I would be restocking shelves and discover a new color combination I would never have considered before, or a yarn that I had always overlooked, and spend the next few days dreaming of all the different patterns I could try. 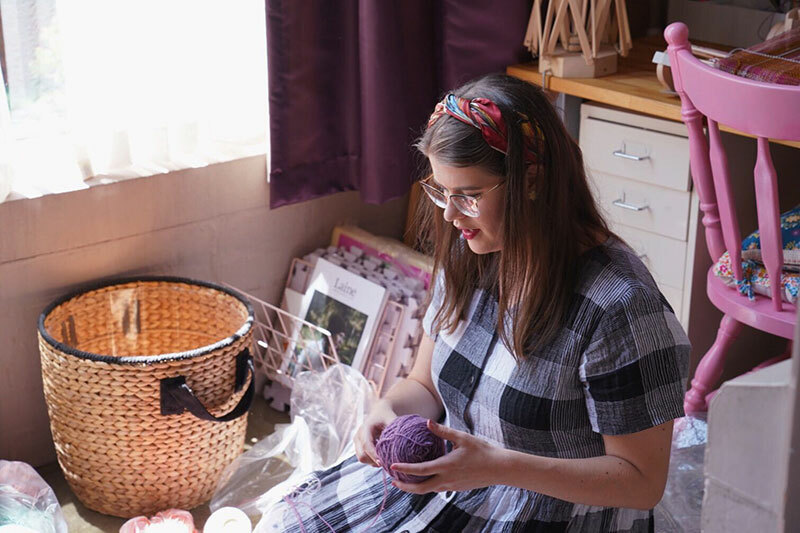 There are also the skeins that I have picked up while traveling, visiting new yarns stores or festivals and discovering brand new yarns to try. I have my treasured ball of silk and baby camel, hand dyed a gentle pink in Switzerland. It is one of the most beautiful yarns I own, but it is so delicate and so special I have never known what to do it with it. I no longer buy single skeins (unless I know exactly what I will make). I have learned my lesson after spending far too much time looking for a pattern to make, or complimentary yarn to buy, to finally make use of the lonely not-quite-enough skeins sitting in my stash. There are also the fibers bought as I discovered new crafts to try. Bags of undyed yarns waiting to be dipped in brews of avocado and eucalyptus. Small quantities of tinsels, rovings and other textured fibers bought during my brief foray into frame weaving. Most recently I have acquired linens and lace weights to weave on my new rigid heddle loom. Of course, there are also the yarns belonging to projects half finished, or yet to be started, or completed but in need of alteration. This is the part where I really need to stop and think “does this bring me joy”? Did I abandon that project because I just got busy, or distracted, or is it because I just don’t want to make that thing anymore? Am I actually ever going to wear that cardigan, or do I need to take it apart and fix my poorly shaped sleeves (or maybe even rip it back completely?). 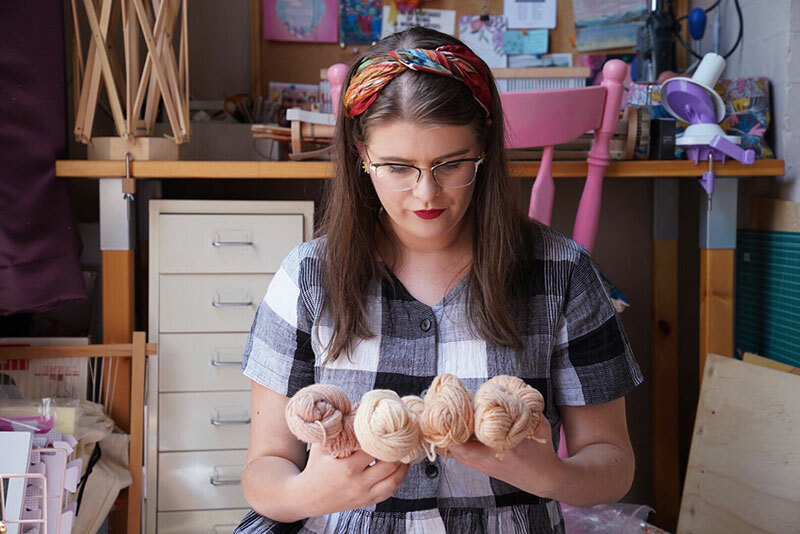 These can be tricky questions to ask, especially when a project is full of all that excitement and inspiration you had when it began - not to mention the hours and hours of work it took to make that sad quarter of a scarf. I am trying to become better at accepting when a project doesn’t bring me joy and taking the steps to turn it into something that does. After all, seams can be unsewn and stitches undone. 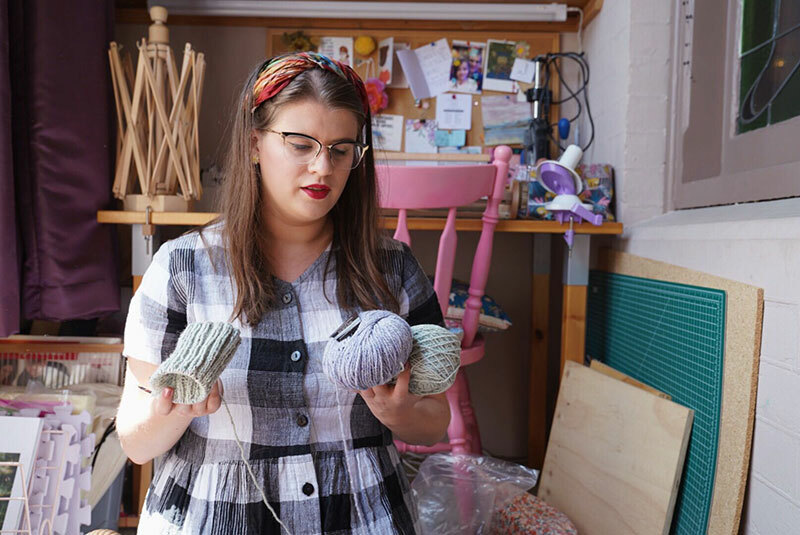 It may be painful at the time, but doesn’t that yarn deserve the chance to become that cowl you wear every day instead of a quarter scarf in the bottom of your basket? Similarly, I am trying to be realistic about whether or not I am ever going to use the yarn that is in my stash. As a maker, I find it hard to let go of things when I see the potential for them to become something. Which is a problem because I can also see that potential in basically anything. That half ball of yellow four ply might not seem interesting right now, but one day it might get the chance to become the flowers in my colorwork gloves, or a bright stripe in a woven scarf, or the tassel earrings that get the most compliments every time I wear them out. I am trying to rethink the way I look at giving away my yarn. Just because I am not using its potential it doesn’t mean that no one will. In fact, the yarn will probably have a better life with someone else. 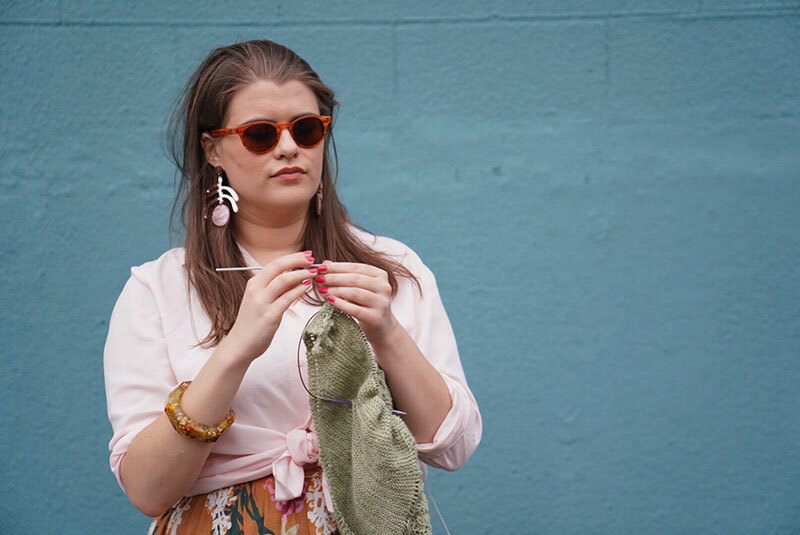 Sure, I could hold onto my mint green baby yarn “just in case”, but I could also donate it to someone who would take it and turn it into something special that will be given away and cherished. And that is something that brings me joy.